For over 15 years, members of the computer science, machine learning, and data mining communities have gathered in a beautiful European location each spring to share ideas about biologically-inspired computation. Stemming from the work of John Holland who pioneered the field of genetic algorithms, multiple approaches have been developed that exploit the dynamics of natural systems to solve computational problems. These algorithms have been applied in a wide variety of fields, and to celebrate and cross-pollinate ideas from these various disciplines the EvoStar event co-locates five conferences at the same venue, covering genetic programming (EuroGP), combinatorial optimization (EvoCOP), music, art, and design (EvoMUSART), multidisciplinary applications (EvoApplications), and computational biology (EvoBIO). EvoStar 2013 will be held in Vienna, Austria on April 3-5, and is always expertly coordinated by the wonderful Jennifer Willies from Napier University, UK. Multiple research groups from the US and Europe will attend to present their exciting work in these areas. Many problems in bioinformatics and statistical analysis use what are considered “greedy” algorithms to fit parameters to data – that is, they settle on a nearby collection of parameters as the solution and potentially miss a global best solution. This problem is well-known in the computer science community for toy problems like bin packing or the knapsack problem. In human genetics, related problems are partitioning complex pedigrees or selecting maximally unrelated individuals from a dataset, and can also appear when maximizing likelihood equations. EvoBIO focuses on using biologically-inspired algorithms (like genetic algorithms) to improve performance for many bioinformatics tasks. For example, Stephen and I have both applied these methods for analysis of genetic data using neural networks, and for forward-time genetic data simulation (additional details here). EvoBIO is very pleased to be sponsored by BMC Biodata Mining, a natural partner for this conference. I recently wrote a blog post for BioMed Central about EvoBIO as well. 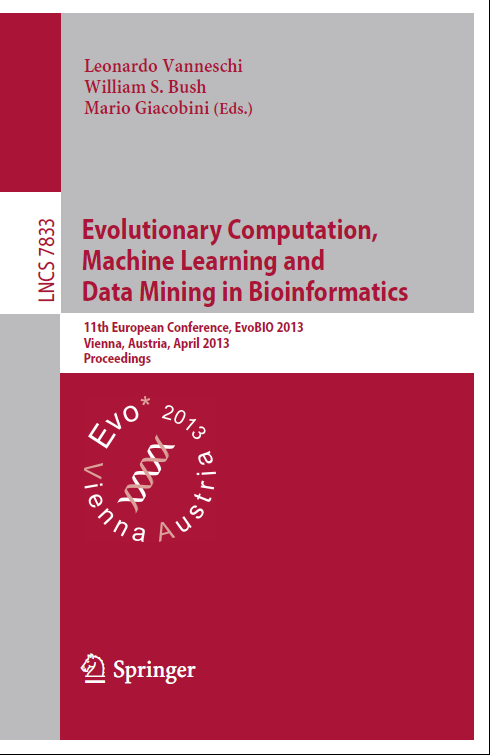 Thanks to their sponsorship, the winner of the EvoBIO best paper award will receive free publication in Biodata Mining, and runners-up will receive 25% discount off the article processing charge. So, if you are in the mood for a new conference and would like to see and influence some of these creative approaches to data analysis, consider attending EvoSTAR -- We'd love to see you there!